As my first ayahuasca ceremony was coming to an end I recall being told over and over again by the Goddess that all is vibration. In order to traverse different planes the soul changes its frequency and then enters into a different realm; a higher plane. The first experience with this traveling was a sensation of being lifted up higher. My finger tapped uncontrollably at times against the wooden floor of the Maloca and I also physically felt a sensation of re-entering into my body at one point that made me nauseous. Up until then I was able to resist the purgative effects of the ayahuasca brew however upon re-entry after my first trip I had to use the vomit bucket. Subsequently while back at home in my mundane existence I have experienced two episodes of a mystical nature that were preceded by an uncontrollable vibration in my arm and a fluttering of my closed eyes. The first episode occurred in a lucid dreamlike state where I was fully aware I was dreaming but just went with it. I started seeing visual hallucinations of geometrical patterns appearing in my vision that increased in speed until there was a climax that exploded into a great white light. This occurred after about a month and a half after returning from the Amazon. The second episode occurred about two and a half months after returning. I had been informed that the effects of ayahuasca may remain in my system for a few months and I have been cognizant of its presence. This next mystical experience occurred while I was meditating. I had been burning incense that night, a mixture of frankincense and myrrh and at first had spent a great deal of time enchanted by the smoke coming from the incense sticks. It had this magical pull to it; it danced and twirled; it had this amazing depth to it; and it would come towards me to caress me while performing its undulating rhythms that were movements so graceful that the fragrant smoke came alive. The ever changing nature of this delightful spectacle was a message straight to my subconscious. I eventually settled back and tried to quiet my mind. At some point when your mind becomes still it is almost like a switch that goes off and you enter another realm. As I traversed this realm I was seeing scenes that seemed real though I was just observing. My mind then sensed purple for some reason and I repeated this in my head, breaking the stillness of my mind. My right arm started to vibrate followed by my eyes fluttering. An explosion of indigo burst into my vision with this wild undulating dark hair in the background accompanying it. I got chills all throughout my body as this lasted for about thirty seconds. I innately knew it was the Goddess. As this journey ended I picked myself up out of my chair and breathed in some of the still smouldering incense. That moment felt so good and I felt so reassured. As well to this day, about three months after returning from the jungle, I still have a level of hearing that has been greatly enhanced. I am hyper-sensitive to bodily noises such as heavy breathing, sighing, throat clearing, coughing, and sniffling. In part it makes me cognizant of our sometimes disgusting profane existence here on earth. This effect however does not occur with my own bodily functions. I do notice that anything that has a reverberation or echoing quality to it is also greatly enhanced. I believe it is my awareness and use of different frequencies that has led to this condition. I mention the above stories because it has led me to think hard about vibration and frequency. My contact and entering into different realms is accompanied by vibration. Everything that is alive has a frequency. Existence can be properly thought of as a verb. All is vibration and of the same source. A noun is a classification that helps us make sense of our surroundings. It is a base point in an ever changing environment but its existence is seriously in doubt. We come into being, grow and change, and then when we stop growing, and our cells stop regenerating and dividing, we die. 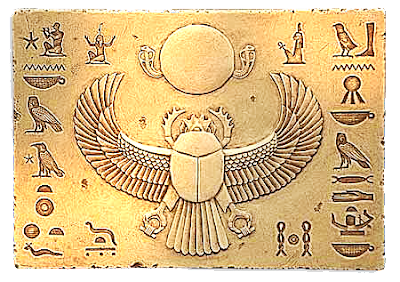 In ancient Egypt the symbol of becoming is the scarab. It is symbolizing the journey in this mundane existence to the east in order to be re-born at dawn out of matter, much like the nightly cyclical journey of the sun. It is the path our souls long to take if we can avoid the trappings of and reconcile with our material incarnation. In the Old Testament this becoming is called hayah in Hebrew. It is a word used to describe the sojourning of the patriarchs who are really archetypes of the soul. In Exodus 3:14 the Elohim say to Moses, that in response to Moses asking who should he tell the Israelites sent him, that I AM sent you. I AM is from hayah. It is this principle of coming into being that is the providing the impetus for the soul journey. Look around you at everything that is alive and changing. Nouns are dead things; an invitation to decay. The snake in ancient Egypt called Apep (Apophis in Greek) wants to stop Re's sun boat because that will put an end to creation. Re has to go so far as to enlist the help of the strong and beastly Set to keep this encroaching serpent at bay. Set is more commonly known as an impediment to the journey of the re- born soul, mythicized as Horus. 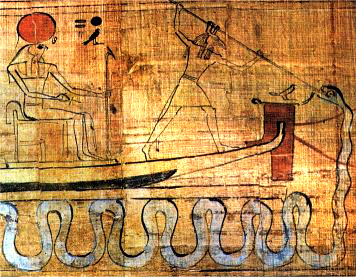 The fighting between these two goes on for generations and the tale is told in the great story of 'The Contendings of Horus and Set.' Set is the life force needed by the soul in this material incarnation that enables the soul to continue on in the journey. 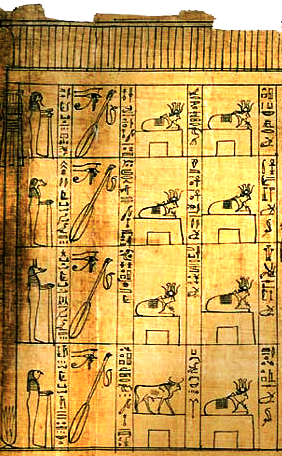 When you understand this you can then see this story encoded in and frankly is the tale being told in the Pentateuch. The life force, beast, red man, antagonist, is Cain, Ishmael, Esau, the profane Canaanites, Pharaoh etc., while the soul on the journey into and out of matter is Abel, Noah, Abraham, Isaac, Jacob, the Israelites etc. They fight, yet they do reconcile, and all are marching ahead to the east. “each person is at each moment capable of remembering all that has ever happened to him and perceiving everything that is happening everywhere in the universe. The function of the brain and nervous system is to protect us from being overwhelmed and confused by this mass of largely useless and irrelevant knowledge, by shutting out most of what we should otherwise perceive or remember at any moment, and leaving only that very small and special selection which is likely to be practically useful. According to such a theory, each one of us is potentially Mind at Large”. It seems this filter is such a logic construct that divides and classifies. A functioning nouning tendency. How we love to classify things and put them in a neat little box! It is psychoactive substances that then seem to release us from this restriction and we can see music, we can smell beauty, and we can hear the sounds of the spheres.